2007 Toyota Camry LE AUTOMATIC 2.4 LITER 4 CYLINDER! 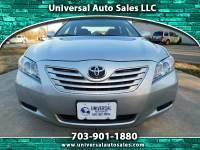 2007 Toyota Camy SE 4 cylinder Sun Roof Gun Metal Gray Clean Carfax!! !